For larversions, click on the images: for some images you may need to use the zoom feature on your browser to see them full size. Vinyl album: AMLS 936 (A&M UK, 1st release 1969, 2nd release 1969 or later, 3rd release 1974 or later). There are three known UK releases, the first two on brown A&M labels, the last with the silver A&M label. The first UK release was a gatefold, except that the record can only be inserted with the inner spread visible i.e. 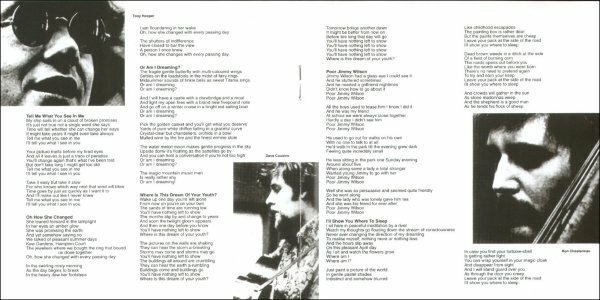 into the middle of the inner sleeve, rather than the more usual gatefold design where the record goes into the far right hand side of the sleeve. The 1st release label is slightly lighter in colour than the second release, with slight differences in typography. The blocky trademark wording on the right above "STEREO", and the change in typography to the same font for "33 1/3 RPM Made In England" appeared on other first releases around 1971/2, so I'd say the second release came out between then and end of 1973 when the silver label was deployed as standard. The third release, with silver label will have come out some time after then. 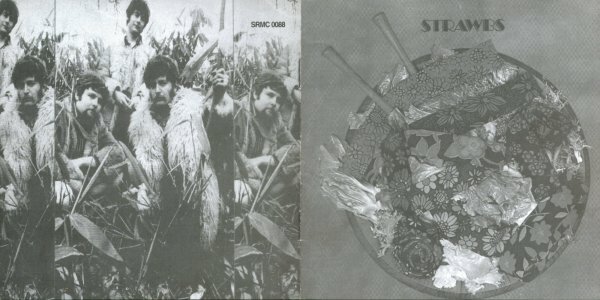 Front cover for all releases is pretty constant - a strange design, art deco lettering for "Strawbs" above a salad bowl with a mixture of salad greens and flowery fabrics, often known as "the tie salad". Back cover also pretty constant, features photos of Cousins, Hooper and Chesterman in afghan coats and flowery shirts, taken in the grounds of Kew Gardens (the coats and the shirts were the idea of their manager John Gayden). The A&M address is their earliest UK office, 10 Neasden Lane NW10 (by the time of the third release no address is given). Inner spread, also pretty constant for all releases, features more photos and includes full lyrics. There seem to be two variants - one with the tracks in serif-style text, the other, probably later with sans serif text. I acquired a copy signed by Ron, then got Tony's signature and recently got Dave to complete the set. Spotted online - a copy autpgraphed by two other key players - arranger Tony Visconti and Richard Wilson, who did the voiceover at the beginning of "Jesus" on side 1. Vinyl album: SLPS 1514 (Sonet, Denmark, 1st release 1969, second release 1969 or later). The sleeve is the same as the central LP insertion UK 1st release (may well have been printed by A&M UK for Sonet, as the Sonet catalogue number is stickered on the back over the UK number. (On myn copy it looksas though the catalgue number on the front was stickered too, but the sticker is no longer there. The label is a red Sonet design, referencing the UK release underneath the Sonet catalogue number. The sleeve for the second release matches the UK second release exactly (down to the Neasden Lane address). The label is the later orange and red Sonet design, again referencing the UK release on the label. Could well have been produced at the sameb time or thereabouts as the UK second release. Silver labels but no date anywhere to date it. Dragonfly was released in Germany as 87 992 ET, I think we can assume this came out at the same time. The sleeve is a UK sleeve with a typed sticker with the German catalogue number. Vinyl album: AML-33,475 (mono); SAML-33,475 (stereo) (Festival, 1969) - deleted. Perhaps the only Strawbs album where dual mono/stereo versions have been produced. The Australian version of Strawbs is a single sleeve, exchanging the grey background behind the tie salad bowl for a creamy white. 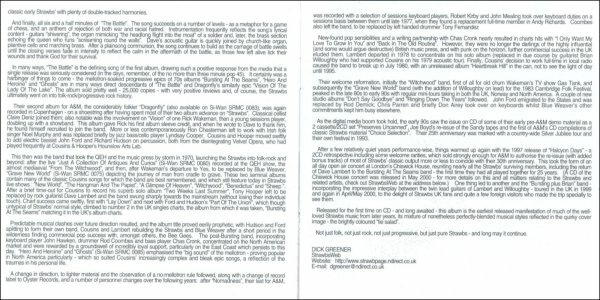 On the reverse, instead of the Kew Gardens picture, there's plain text sleeve notes. Click on the back cover for a larger size version that is readable. Colin Field originally sent scans of this rarity, but I recently found one on Ebay - came with a nice Festival Records flyer which you could use to order their catalogue. Single sleeve, with broadly same front and back - white panel on top left of front cover modified to include larger A&M logo and SA catalogue number. Back cover has SA cat number top left and a "STEREO also plays mono " panel bottom right replacing text on other editions. No address. An a tiny unreadable logo "Ariona Press" at bottom right under the A&M logo (could be Arione, Arions). Front cover only is laminated - my copy is a bit worse for wear and the lamination is peeling off. Clear plastic protective inner. 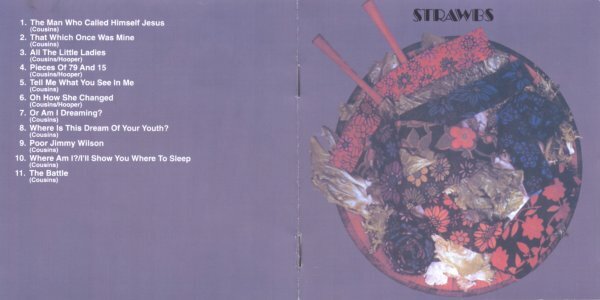 Likely that Strawbs and Dragonfly were released in Japan more or less the same time as Ghosts in early 1975 (there's a sign off on the Japanese sleeve notes "75. 2", which is likely to be the date (Feb 75) for the sleeve notes. The gatefold sleeve is more or less the same as the 2nd UK release, even down to the Neasden lane address: the A&M logo on the front has been altered to show the AML 234 numbering. Inside there is a 2-sided insert, one side with track listing and sleeve notes in Japanese, the other pictures of most of the other A&M/King Records Strawbs-related releases. Vinyl album: AML 234 (A&M/King Records, Japan, probably 1975). Dragonfly had a promo release, so it's almost certain this album had one too - anyone got one? Nice 180gm vinly reissue. The stiff high quality card cover duplicates the original, except that there's no A&M logo on the front at the top left and the content at the bottom of the back cover has been retypeset with Tapestry's information included rather than A&M's. Tapestry labels. Early Strawbs Vinyl album (Canada only): SP9014 (A&M, 1974) 2LP set re-issues Strawbs and Strawbs. The two discs are arranged with a side of Strawbs on one side and a side of Strawbs on the other so that you can stack the discs on a multi-changer record player, and play one of the albums in sequence, then turn them over and do the same thing with the other album. CD: SRMC 0088 (Si-Wan, 2000). Packaging is got up to look like the album (scans and 4pp sleeve notes supplied by yours truly). Outer cover is in colour, inside a booklet in black & white has front and back reproduced again, with the lyrics and photos from the vinyl album PLUS 3 additional unpublished shots from the Kew Gardens photo session. Two further non-contemporary photos are added to fill out the book - one of Cousins, Hud, John Ford and Blue Weaver (Dave playing his electric Danelectro, probably "Tomorrow") and the "Shine On Silver Sun" promo photo, with the Hero and Heroine band in poncy silk shirts and ties, arranged tastefully in a heap, which appears on the front of the recently issued collection, Tears And Pavan. The CD is done up to look like a mini-vinyl record, with the tie-salad motif as its label. Excellent job (specially the sleeve notes [grin]). NB This is not a bootleg. Before I wrote the sleeve notes I asked for and was shown a contract which licensed the rights from A&M. 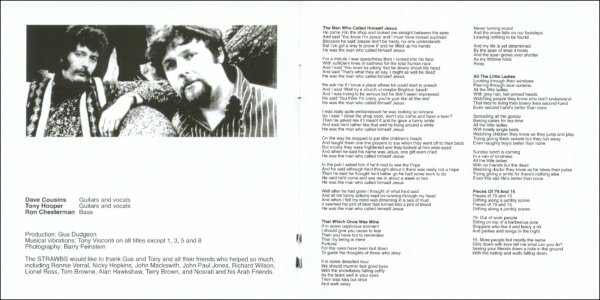 Reproduces inner spread of UK album with lyrics and pics. CD: PL 527 (Progressive Line (bootleg)). Standard jewel case CD, with inner (including lyrics) described below - NOT like the Si-Wan album facsimile styled release. No sleeve notes as written by me! The cover is exactly the same as the A&M original vinyl that I still have, except of course for the A&M label at the left top. On the back , the song listing in white letters on a gray background, as a button list, not as a continuous line as in the original LP. No picture. In small type at the bottom, it says: Progressive Line is a division of Dole Music Inc., 135 Macleay Street, Potts Point, Sydney, NSW 2011. Licensed by Today Music, Inc., 194 Bulwara road, Sydney, NS 2007. Made in Australia. Then all the lyrics on pp. 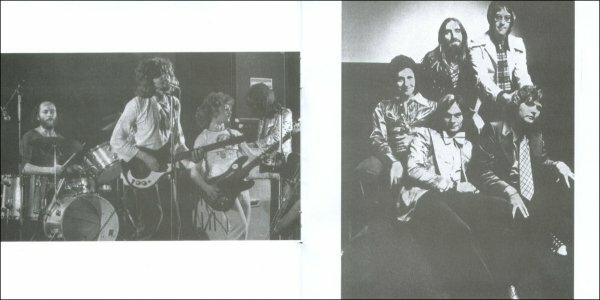 2 to 6 The three B&W pictures found inside the centerfold cover of the vinyl are found among the lyrics pages. 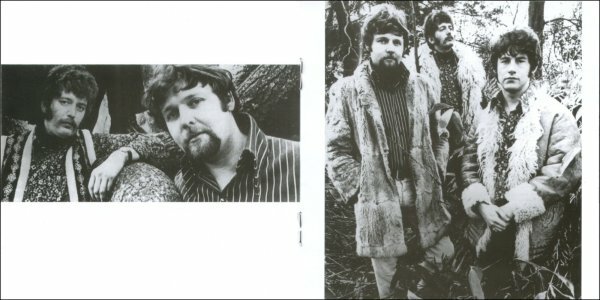 On p7, another B&W picture absent from the Strawbs vinyl [DG - see note above]. Same period, certainly the same photo session. Dave has this same striped shirt, and all three wear these shaggy fur or suede coats.... The picture at the back of the vinyl centerfold (sort of pink and blue) is absent from the Progressive Line CD. 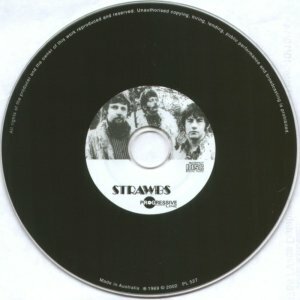 The front side of the CD bears a B&W reproduction of the photograph seen on p. 7 of the PL booklet, with the words STRAWBS written with a font similar to that found on the cover of the vinyl and the CD. CD bootleg: Russia, 2005) . This bootleg probably comes from the 1999 Si-Wan release above. Minimal packaging - plain silver CD. The record company is listed as COE Records, with a strange address with a non-existent UK postcode. The back states that copyright in this recording is owned by TABS Ltd. (untrue) and gives a @copy date in COE Records' name of 2005. Discogs reports that they are in fact Russian bootlegs. More on COE Records on Discogs - it seems they have also bootlegged All Our Own Work. CD: A&M 75302679 (Universal, 2008). Promo CDs were passed to individual recipients, numbered and with their name printed on the CD. CD: A&M 75302679 (Universal, 2008). 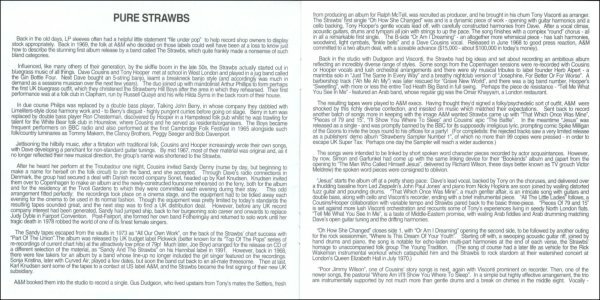 This is THE definitive CD release of Strawbs - the one you should buy: the long-awaited official 2008 re-issue on CD of this early Strawbs album with excellent sleeve notes by Mark Powell and three bonus tracks, "That Which Once Was Mine", "Poor Jimmy Wilson" (both previously unreleased) and "The Battle", which appeared on Taste - all recorded for John Peel's 'Top Gear' on BBC Radio 1, 12th January 1969. 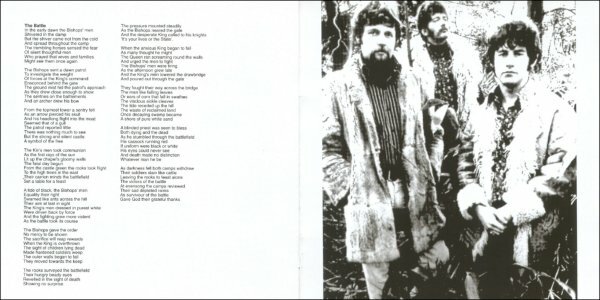 According to the Taste sleeve notes, "The Battle" features Rick Wakeman on keyboards and Ronnie Verrall on snare. Also some interview material with Dave and Tony. These appear to have been bootlegged in Russia - identical packaging, except that there is a different pressing number starting "VO1 ..." visible from the bottom of the CD. CD: UICY-78833 (Universal, Japan, 2018) Facsimile reissue including Japanese booklet, based firmly on UK vinyl release. Obi mimics original Japanese release. CD inserted at middle of gatefold, just like original UK release - nice touch.